A paradise within a paradise, Denarau Island is the ideal location for tourists keen to explore both Fiji’s amazing mainland, and the surrounding islands. Located on the western side of Viti Levu, Denarau Island is the largest integrated island resort in the South Pacific. Connected to Fiji’s mainland via bridge, Denarau Island is conveniently located close to Nadi’s colourful city centre and the international airport. Port Denarau Marina is a major departure point for transfers and cruises, and a gateway to the popular Mamanuca and Yasawa island groups. Whether you seek romance, relaxation, or a great outdoor escape, it’s all here on Denarau Island. A nature lover’s dream, its spectacular beauty and tranquility is sure to leave you relaxed and rejuvenated. Check into our hotel in Denarau, take a swing at the championship golf course and tennis complex, or explore further afield with diving, snorkelling, trekking, sailing and more. If you’re looking for the perfect Denarau accommodation to act as your base and recharge your batteries, AccorHotels' Sofitel Fiji Resort and Spa is a great choice. Overlooking the beachfront, and offering a selection of world-class restaurants and bars, our slice of Fijian paradise is the perfect combination of French luxury and local cuisine. 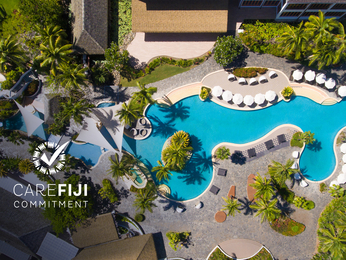 Contact our friendly Denarau accommodation staff now to learn more about how we can make your stay in Fiji unforgettable.